In the early 80's, Microsoft's Multiplan lost out to Lotus 1-2-3 in the marketplace. According to one Microsoft programmer, a few of the key people working on DOS 2.0 had a saying at the time that "DOS isn't done until Lotus won't run." They managed to code a few hidden bugs into DOS 2.0 that caused Lotus 1-2-3 to breakdown when it was loaded. "There were as few as three or four people who knew this was being done," the employee said. He felt the highly competitive Gates was the ringleader. The first two female executives hired at Microsoft in 1985 were recruited to meet federal affirmative action guidelines so that the company could qualify for a lucrative Air Force contract. One source says,"They would say, 'Well, let's hire two women because we can pay them half as much as we will have to pay a man, and we can give them all this other crap work to do because they are women.' That's directly out of Bill's mouth...." Gates treated one of these executives so badly that she asked to be transferred away from him. Microsoft managers used the company's e-mail system to secretly spy on employee work habits. Only those employees who worked weekends could collect bonuses. In time word got out and some employees logged into their e-mail on weekends with a modem from home so it would appear they had come in. The authors have done a pretty good job at guessing what the future might hold, as we look back from several years after its publication. (As some gifted souls have so insightfully noted, the computer industry does actually change fairly rapidly, thus a book from the early-mid 1990s might be sort of dated in 2000.) What is impressive is how well it's held up over the years. The analysis of Gates' psychology, the corporate culture of Microsoft and its evolution, and the various spasms of its early years are all right on the money, and particularly interesting in light of the current DOJ proceedings. The material about Ballmer will be of interest to anyone keeping current with his rise in management at the company. It also paints an irresistable picture of the IBM that once was certain it could tell us all how we would use computers. 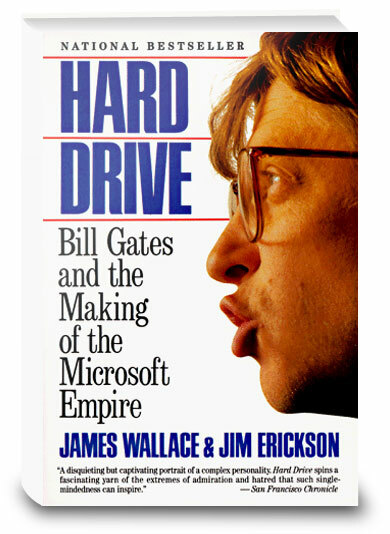 Click the button below to add the Hard Drive: Bill Gates and the Making of the Microsoft Empire to your wish list.